Affordable Closets Plus offers an amazing variety of space solutions suitable for every home or business. We are a family-owned company with over 20 years of experience perfecting our craft. Our mission has always been to make the most of your space, using an eye for design and the finest quality materials at affordable prices. Whether using one of our many standard options or a fine-cabinetry solution, each and every space is custom designed to meet your individual needs, lifestyle and budget. And, because we do all our own manufacturing, our capabilities are unlimited. You don't need to struggle with storage issues. We'll turn your home or business into an organized, efficient, and eye-catching space. Our team meets with you one-on-one to get a comprehensive understanding of your lifestyle and storage needs. Taking that into consideration with your budget, we design storage solutions that fit beautifully into your home, storefront, or office either using one of our many affordable everyday system solutions, and custom-built designs, or a combination of both. 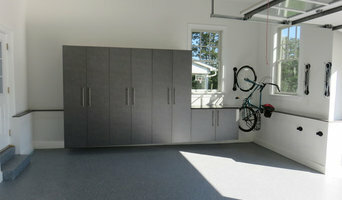 Design, Manufacture and Install Custom Closets and other storage areas. VICTORY CLOSETS has transformed the idea of attractive, aftordable, easy-to-reconfigure closets from a dream to reality. Our clean, simple design allows us to use premium, durable materials yet still keep pricing within reach. Yes, you can have it all – a beautiful and sensible storage solution with the flexibility to grow and change with your needs, and quality to last a lifetime. VICTORY CLOSETS are designed and built by cabinetmakers in eastern Pennsylvania. Our standard features include: • Cabinet-grade plywood drawer boxes • Full extension ball-bearing glides • 14” deep shelves and drawers • Premium hardware finishes Our unique patented design gives you the versatility to reconfigure your closet layout, whenever and however you want. All components are self-locking, simply lift and move. It’s really that easy! Forget the stress of committing to a single design, you can change or add to your closet as your needs change. The VICTORY CLOSETS system is comprised of pre-produced stock parts. This allows us to design, build and install very efficiently. An assortment of stock parts and components will be used to create your custom closet design based on your specific needs and space conguration. Our quoting process is simple and straightforward. Typically a 3D drawing and pricing are supplied within 48 hours. Finishes & Options: Our Coffee and Natural Maple finishes create a warm, rich look. A classic White finish complements all decors and is also a popular choice for kids’ rooms, pantries and laundry rooms. Hardware: Choose Oil-Rubbed Bronze or Brushed Nickel clothes rods, drawer pulls and accessories. Accessories: Add wire baskets, a laundry hamper, valet rod, tie rack and other options to your closet. Best of Houzz Five Years In A Row! Bella Systems Philly can help you get organized! Our product line includes much more than just custom closets. We can help you with your closets, pantries, wall units, garages, basements, laundry rooms, and even your home office. We are experts at making the most of your storage space. The process of getting this completed starts by us using a state of the art 3D design software to plan out your project during your design consultation. This also gives you the ability to see exactly how your space will look before it has been completed. Your designer will going over with you certain criteria's of your project such as: How much long Hang space will you need? Do you hang your pants long or folded? How many pairs of shoes? The need for drawers or pull out baskets? 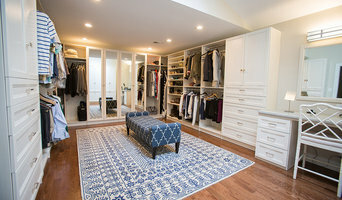 Whether you want to enhance your current closet space, organize your garage, or design the perfect home office Bella Systems Philly is your choice for quality and service. Our goal is to exceed our customer's expectations on every project. By using only furniture grade materials and providing excellent customer service to our clients. This ensures we make the whole process as luxurious as our closets. Custom storage solutions for your home, garage and office. Focused areas in New Jersey: Montclair, Summit, Chatham, Short Hills, Livingston, Mahwah, Franklin Lakes, Creskill, Englewood, Tenafly. The story of Closets & Cabinetry by Closet City begins in 1984, when the owners of a flourishing fence company recognized that closet organization and storage solutions could be the next big thing. Since then, we’ve helped customers throughout the Philadelphia area find new ways to make their homes more organized and inviting. We spent our first three decades in Montgomeryville, and in the spring of 2018 moved to a new facility in Harleysville, PA. At our roots we’re still a small, privately-owned business – not a franchise – that has evolved from a simple closet organization business. Over the years we’ve expanded our product line along with our expertise to include wall units, garage storage, cabinetry and more. Whether you need a new walk-in closet, a way to turn a spare room into a home office, or want to install a new Murphy bed, our team can help you reinvent your space. Contact us today, or visit our showroom, to find out how we can help you organize your home. At Closets by Design we work to simplify your life. We design, build and install custom closets, garage cabinets, home offices, laundries, pantries and much more. With a wide selection of finishes, accessories and hardware, you will get the customized look you have always dreamt of. California Closets has been helping homeowners de-clutter and re-organize their home for over two decades! We have watched many competitors come and go, knowing that we have the strength of our national brand and the local, personal touch of a family owned and operated business. We looked forward to the opportunity of serving you! We work with Home Builders, Architects, General contractors, Designers, Home owners, etc. From the initial consultation to the final, exquisite product, Top Shelf provides friendly, professional, blue ribbon service. Each and every member of our team is dedicated to maximizing a home’s true potential – making your home work for you – and giving you back your hard-earned, precious free-time. ‘Cause life’s too busy to be disorganized. Top Shelf Closets and Cabinetry serves the entire Delaware Valley, including the Jersey Shore. We provide custom laminate and real wood closets; as well as unique solutions for laundry rooms, garages, basements, mudrooms, libraries, entertainment centers and home offices. Founded in 1988, Top Shelf originally provided simple wire shelving to the Chester County community. Today, Top Shelf’s state-of-the-art facility produces a full-color line of shelving not only for the Main Line’s better homes, but for homes in New Jersey, New York – even as far as Bermuda! For nearly 20 years, our hallmarks – experience, passion and quality – have guaranteed our customers the very best solutions for organizing a messy world. At Top Shelf, it’s all about you – we are crazy about customer service! Your Top Shelf experience begins with a free, in-home consultation – or even earlier, with a review of your home’s blueprints. Our designer will listen to your wants and needs – and design exceptional storage solutions that meet and exceed your demands. Once you review your full-color designs, it’s time to meet our friendly installation team. We pride ourselves on clean, quick installations, going that extra mile to work around your busy schedule or settlement date. Our goal isn’t just 100% customer satisfaction – we want you to be utterly amazed by your closets! Each customer brings his or her own needs and unique ideas to the drawing board; you are a partner in the design of your closets, and are only limited by your imagination. Top Shelf can provide endless storage solutions – to meet your most basic need or entertain your lightest whim. A sampling of our offerings would include: a full-line of colors, wood-grain and stains; sliding drawers, valets, belt and tie racks; units with crown molding, full-length mirrors and jewelry trays; islands with built-in drawers; etched glass-front doors; sports and hobby units for garage or basement; and units with their own built-in lighting system. Before hiring a professional organizer, consider exactly what you need. Have you just moved into a Bethlehem, PA home and have no idea where to put everything? You may want to consider an organizer who specializes in room-by-room space planning or estate organization. Perhaps you’re faced with a tiny closet and an overflowing wardrobe. In that case find a professional who focuses on closets to help you get back on track. Also consider the types of objects that need organization. Are they items like books, family photos, files or collections? You’ll want a professional organizer who has experience designing custom systems with Bethlehem, PA companies that will best fit your needs. Find a professional closet and home organizer on Houzz. Narrow your search in the Professionals section on Houzz to Bethlehem, PA closets and home organization.